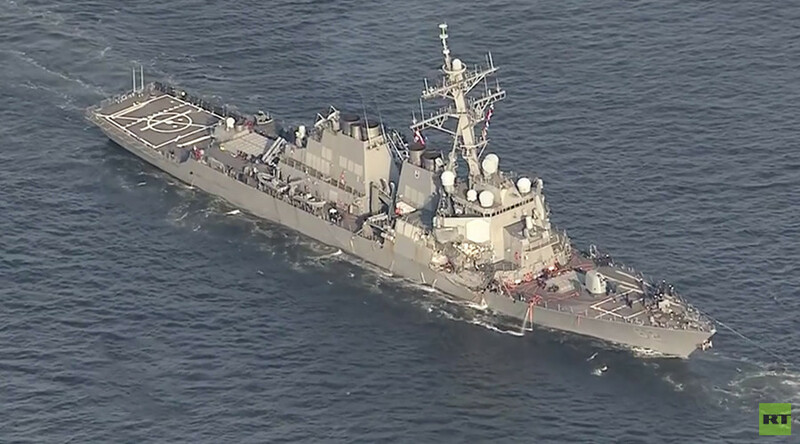 Seven US Navy sailors are missing and at least three are injured, including the commander of the USS Fitzgerald, which collided with a merchant vessel near Yokosuka, Japan, according to a US Pacific Fleet spokesman. US sailors reportedly called the Japanese Coast Guard for assistance. "There are seven Sailors unaccounted for; the ship and the Japanese Coast Guard continues to search for them," the US 7th Fleet has confirmed. The same account was previously reported by the Japanese Coast Guard to Japanese public TV channel NHK. Among the injured was the commanding officer of the USS Fitzgerald, Commander Bryce Benson, who is in stable condition after being transferred to US Naval Hospital Yokosuka, according to the 7th Fleet. 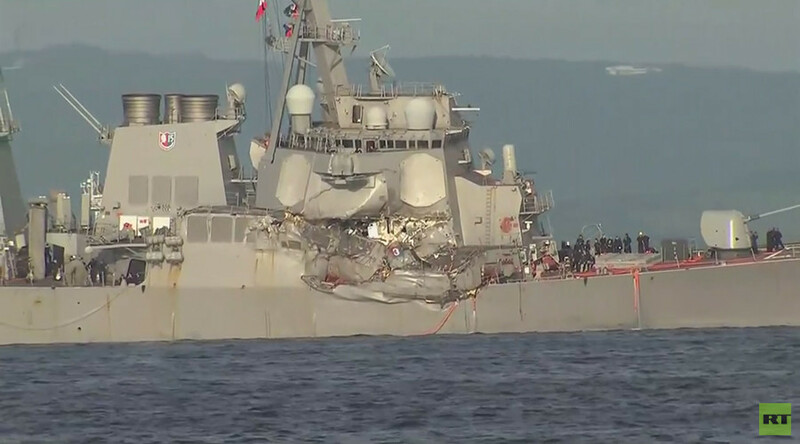 "Other injured [sic] are being assessed," the fleet said. One injured sailor was being evacuated from the US ship by a Japanese Coast Guard helicopter, the US Navy reported earlier. The crash occurred 56 nautical miles southwest of Yokosuka at 2:30am local time, June 17, according to the US Pacific Fleet. The Japanese Coast Guard identified the commercial ship as a Philippine container vessel, Sputnik news agency reported. UPDATE: USS Fitzgerald involved in a collision with Philippine-flagged merchant vessel ACX Crystal. Japanese Coast Guard are on scene. Medical evacuations reportedly occurred with assistance from the Japanese Coast Guard. NHK reported that the USS Fitzgerald, an Arleigh Burke-class destroyer, was rendered "unable to operate" and suffered flooding, Reuters reported. "The USS Fitzgerald suffered damage on her starboard side above and below the waterline," the US 7th Fleet reported. The US Pacific Fleet said: "The extent of damage is being determined. The extent of personnel injuries is being determined. The incident will be investigated." The US 7th Fleet posted on its Facebook page that the destroyer was on its way "back to Yokosuka" at a speed of 3 knots, and being assisted by Commander Fleet Activities Yokosuka tugboats. The flooding was later stabilized and sailors from the USS Dewey guided missile destroyer came aboard to “assist in damage control efforts,” the Navy’s 7th Fleet said. Last month, a US Navy cruiser collided with a South Korean fishing vessel.